Over Thanksgiving, a lucky pair of turkeys received their pardon -- but in Thailand thousands of long-tailed monkeys are granted a feast. 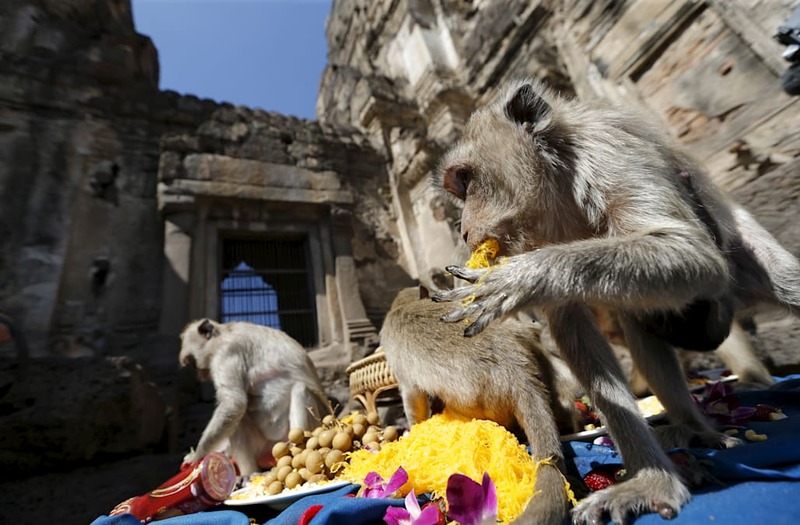 Instead of a gravy train, three giant trucks filled with fruit are presented to the thousands of monkeys living in the Province of Lopburi at the Monkey Buffet Festival. It's the Thai people's way of giving thanks to the cheeky primates for driving tourists to the monkey province. The festival has been toned down a bit since the country is still in the one year mourning period, following the death of King Bhumibol Adulyadej. After a hearty feast, rather than a tryptophan induced nap or arguing over politics, it's back to getting piggyback rides from tourists and checking for any last bits of food on their friends.